What are the differences between a Centrifugal and a Positive Displacement Supercharger system? There are two basic types of superchargers used today for cars and trucks: positive displacement and centrifugal. Each one has advantages and disadvantages so please carefully read and understand this article that shares how each will affect your vehicle. When we receive phone calls from potential customers we often hear them say they just want to “Go Fast!” Certainly any type of supercharger will take care of that need but there are many other issues that you need to consider before you lay out thousands of your hard earned $s to get the kit of your dreams. Tork Tech wants you to be 100% thrilled with any purchase you make, not disappointed because a kit does not do everything you thought it would. Please read on! Centrifugal superchargers use centrifugal forces to create boost. Centrifugal superchargers have an impeller where air enters along the center axis and is “thrown” to the impeller’s outer radius by centrifugal force as shown in the diagram below. Centrifugal force increases with the square of RPM so centrifugal superchargers normally operate at very high RPM’s, typically around 50,000 RPM’s and only increase boost at high engine RPM. - Are mechanically very simple and inexpensive to manufacture. - Requires less horsepower to operate. - Makes no or little boost and hp below 4,000 engine RPM. If you follow this link, PLEASE at least read the last major paragraph of this write up as it very accurately describes the good and bad issues of driving a centrifugal supercharged street car. Positive displacement superchargers have two rotors that mesh with each other and move air within their cavities from their entry port to the exit port as shown in the diagram below. Positive displacement superchargers typically are rated in displacement per revolution. The Magnuson MP112 displaces 112 cubic inches or 1.83L per revolution at about 85% volumetric efficiency. The Magnuson TVS 1900 displaces 1.9 liters and the TVS 2300 displaces 2.3 liters per revolution. Boost pressure is adjusted by changing the overdrive ratio the supercharger is operated at. Typically the supercharger is driven 2.5 to 4.0 times crankshaft speed (or engine RPM). - Because of the wide power range it is great for a street car or truck. - A Roots supercharger is more expensive to manufacture. - Requires more power to turn at high rpms. TTI intercooled kits typically make around 400 - 700 RWHP, as do some centrifugal kits. But you should not ONLY look at the peak HP/TQ numbers as they only tell what the max effort that each kit is capable of. Sure, these numbers are what everyone brags about but they only one point on the HP and TQ graphs. What does the rest of the curve from 2000 RPM to redline look like? As a general rule of thumb, positive displacement kits will make significantly more HP and TQ “under the curve” across the entire RPM band. 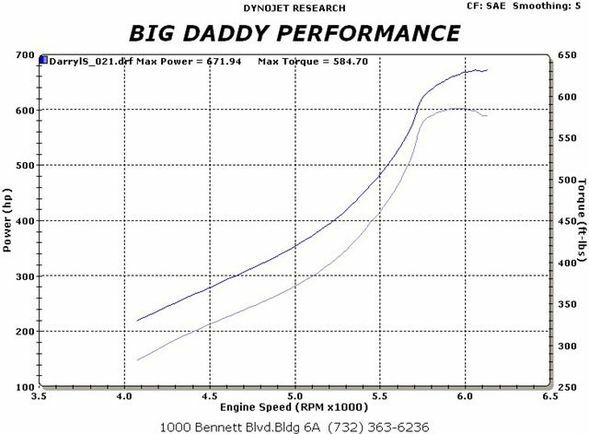 Below is a comparison of a built (ported heads and cams) 4.6L Mustang with a Tork Tech kit running 12 psi boost and the other of a very high output centrifugal supercharged Mustang making 671 rwhp on approximately 18 psi boost. Note: The actual TTI dyno chart can be found under the “Dyno Charts” section of the website. Remember that TTI kits can certainly make MUCH MORE power than this but we are trying to show that even a modestly powered positive displacement supercharger kit can feel just as great, or even more so except for the last few hundred RPM, as a very high output centrifugal kit. Note that from 2,500 rpms to 4,500 rpm the Tork Tech kit makes 150 more horsepower then a high output centrifugal supercharger kit, the centrifugal does not catch up to the TTI kit until 5,500 rpms. From 5,500 rpm to 6,250 rpms the centrifugal comes into its power band making huge horsepower numbers over a very narrow rpm band. 99% percent of the time a street driven engine is running between 2,500 rpm and 5,500 rpm in normal use. Under these conditions a positive displacement supercharger has a huge advantage over a centrifugal. Now consider a max effort run shifting up through the gears. During a typical shift the transmission will cause the engine to loose approx. 30 to 35% of engine RPM. Assuming both cars shift at 6,250 rpm and hit the next gear at nearly 4100 rpm, the average horsepower between shift points for the TTI equipped car is 466 HP while the more powerful centrifugal is only 451 HP due to different power production characteristic. So, which is best for you? The important thing to remember about the centrifugal kits is that they typically make little, or no boost below 4000 RPM. Ask yourself, "How much time does my engine see above 4000 RPM on a daily basis?" An honest answer is probably about 2% of the time. So, do you want to spend your hard earned $$ on a supercharger kit that you can feel 2% of the time, or one that you WILL feel 100% of the time? Now that you know the facts regarding supercharger output characteristics you can make an educated determination which type of supercharger is best for you. For reference, the actual charts of the centrifugal and TTI setups referenced above are available here.